Yesterday marked the middle of school vacation week – and the height of sibling bickering at my house. Wanting to take one day off from skiing, and hoping for a lazy morning, we stayed home instead of heading out the door to Cannon Mountain. For a few minutes, all was well. There was peaceful playing and sharing of toys. But soon enough arguments broke out about, well, everything. Who got to play on which side of the living room. Who owned the unicorn found wedged between couch cushions. Who was allowed to read the book left on the floor overnight. The peace was temporarily restored with a trip to Littleton and stops at two of our favorite places: the Village Book Store, filled with games and toys and books for all ages, and Chutters, home of the Guinness record holding World’s Longest Candy Counter. After lunch with my husband in town, it was back home – to more bickering. I don’t like refereeing. Didn’t like it when I reffed U12 soccer games as a high school kid, and don’t like it now that I’m called on by three little kids on a regular basis to break up squabbles large and little. Young as they are, I figure the kids are old enough to work things out on their own, and most of the time they are best buddies and get along great, but yesterday each disagreement seemed ready to come to blows. The afternoon was gray and wet and windy, the sky trying to snow, the temperature right on the cusp of being warm enough to rain. Not a day that you’d rush outside with longing. But outside we went. I sent the kids out first, and by the time I’d joined them five minutes later, the squabbles had disappeared, replaced by grins and happy shrieks as they pushed each other down the short, steep pitch of the snow fort. 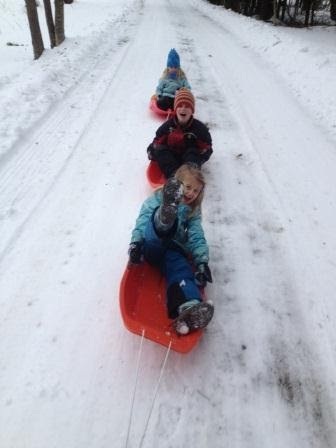 I tied three of our old, plastic sleds together, and the kids each hopped into one so I could pull them up the long driveway and back down again. I used to do this when they were tiny, when the littlest one was a baby and the other two toddlers. It was the only way I could squeeze in any exercise back then. Hauling about 120 pounds of kids and their snow gear around the snowy yard still beats going to the gym. Once they tired me out, they each took a turn pulling the other two. Never one to be outdone, even the little one, just turned 4 years old, dragged her older and bigger brother and sister in a lap around the house. As dinnertime approached, we came back inside with wet mittens and rosy cheeks, our spirits buoyed by a little fresh air, peaceful playing restored for the evening. 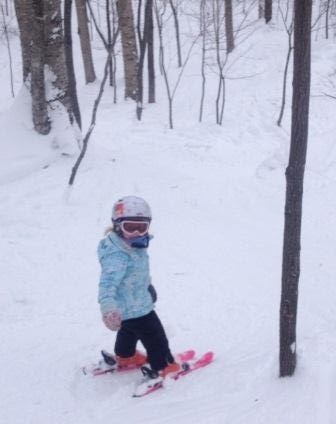 While other people hunkered down today to wait out the storm, our family went skiing. And the skiing was good. It wasn’t two feet of perfect Colorado powder amid a blue-sky backdrop. It was more like a foot or so of New England snow, windswept by bone-chilling gusts that were still blasting away. No matter – everything is relative, including skiing, and who doesn’t love a powder day? Getting out to enjoy the gifts of Mother Nature is a heck of a lot more fun than lamenting the weather. In the ridiculous craze of over-hyped weather reporting and naming snow storms (Nemo? Really? ), snow in February has become a surprising event for some, it seems. But, um, it IS winter in New England. Perhaps my memory is skewed, but I don’t think we used to get so worked up about the weather. My only memory of the Blizzard of ’78 is of huge piles of snow in our driveway, transformed into snow forts for a big snowball battle. I was only 4 years old then, and my brothers were 7 and 1: too young, all of us, to worry about the implications of closed roads and power outages. My dad, who worked about a 45-minute car commute away, barely made if off the Mass Pike that February day before it was closed. One of the guys in his carpool leaned out the window, scraping ice off the windshield, the entire drive home. Thankfully, they all made it home safe and sound. Probably some folks were tucked into warm blankets by the fireplace back in 1978, too. That just wasn’t my family’s style. Still isn’t. Mom drove us over many a treacherous road to reach Franconia, NH, from our central Massachusetts home to ski each winter weekend. When it snowed, we were sent outside to play, just like we were in pretty much any other weather. We were kids; we loved the snow. So, when I hear people freaking out about “Snowstorm Nemo,” I don’t really get it. I understand public officials urging people to stay off the roads, but do folks really need to be told to stay inside? Have we lost our basic safety common sense to the point where we don’t know if it’s too cold or windy to go out? Certainly it’s not too snowy. Beyond the paranoia-invoking weather media, I am also vexed by the New Englanders who bemoan the snow. Living in New England and not wanting it to snow in mid-winter is just plain silly. Move south, for crying out loud, and leave the powder for those of us who appreciate it. As for me, I’ll keep doing my snow dance, hoping for more of the white stuff this season, dreaming of powder days. They just don’t make ski trails like they used to, and for those of us who ski areas that came of age in the 1930s and ‘40s, the original trails are often our favorites. A look at Cannon Mountain’s trail map reveals runs that curve with the mountain’s contours – twisting here, turning there, rising and falling with the slope, merging into other trails, then separating again. These trails have character – and history. 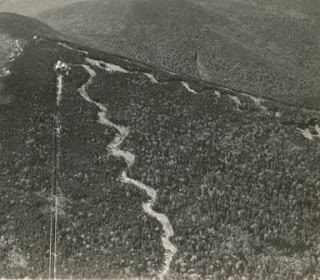 Cannon, Ravine, and Taft Slalom trails, circa 1939. My three favorite Cannon runs are Upper Cannon, Upper Ravine, and – if the natural snow is good and deep – Middle Hardscrabble. Long and winding trails all, and each with its own charm. The Cannon Trail was cut in 1938 to correspond with the opening of the Cannon Mountain Aerial Tramway, which was the first passenger tram in North America. Ravine was added a year later, and Hardscrabble soon after. For a couple of decades Cannon Mountain hosted weekly time trials on the 2-mile long Cannon Trail. The second trail cut on the mountain, Cannon originally coiled its way down from high summit to mountain base. Much has changed in skiing in the past 75 years, including the trail, which is now separated into Upper, Middle, and Lower Cannon and intersected by several other runs and a couple of chairlifts. Despite the changes, Upper Cannon retains most of the curves and all the allure of its original design: winding around thick clumps of spruce, turning with the mountain’s undulations, and twisting down steep pitches. Last week, in that brief window between blessed new snow and dreaded winter rain, I caught the trail with no one in front of me and kicked off downhill, turning only where the trail turns, clinging to corners, absorbing rolls, blissful in the power and speed that have drawn so many to skiing for so long. Whenever I ski Upper Cannon I think of all those racers who would line up at the top of the mountain for the time trials each week. Those who raced the length of the trail in under three and a half minutes won a coveted Gold Cannon pin. The weekly challenge was discontinued in the early 1960s for a variety of reasons, including the changing landscape of the trails system. In the days before snowmaking guns and snocats, ski trails were created narrow and winding to protect and hold the natural snowfall. There were no bulldozers to scrape and remove a mountain’s lumps and bumps, only axes, cross-cut saws, and occasionally dynamite to blast away large boulders. Adding to the challenge of completing the Cannon trail in time for winter came the roaring Hurricane of 1938, which toppled trees along the designed route, including some high timber legendary trail designer Sel Hannah had hoped would block the winds that push through the mid-section of the mountain. Early grooming at Cannon involved a crew of shovelers working its way slowly – over days, not hours – down the long trails to fill in ruts after a busy weekend. Ski patrollers followed to foot pack the snow. Today’s powerful grooming machines restore the snow each night into neat, even rows of corduroy that make cruising these old trails an absolute joy. The runs have been widened some over the years, and smoothed a bit, but they retain enough of the original design that their character remains intact. I am not alone in loving these long and winding trails. I have asked longtime Cannon skiers from different generations about their favorites, and they nearly always claim the twisting runs. 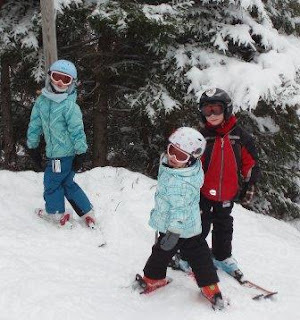 Likewise, the young skiers I talk with at the Franconia Ski Club nearly always pick Taft Slalom (cut in 1933), Upper Cannon (1938), or Upper Ravine (1939) as the most fun to ski. Sure, it’s fun sometimes to bomb the wide, steep swath of Avalanche or count your turns on the wide open Cannonball. On powder days, laps on the Zoomer Chair and the “front five” trails are a blast. But whether the snow is natural or manmade, the sky blue bird or dull gray, I like to chase the mountain’s legends down Upper Cannon, the wind in my face, connected through my skis and my joy to both the skiers of long ago and the ones getting off the tram just behind me. Original content by Meghan McCarthy McPhaul and posted to her Blog: Writings from a full life. This essay also appears in the February 8, 2013 edition of the Littleton-Record. Maggie Doughty came to the United States 50 years ago and has taught skiing at Cannon Mountain for over three decades. She taught my little brother how to ski about 30 years ago, and this winter two of my children have been in her class during Friday ski outings with school. Here is a link to the story I wrote recently about Maggie for the Littleton Courier.